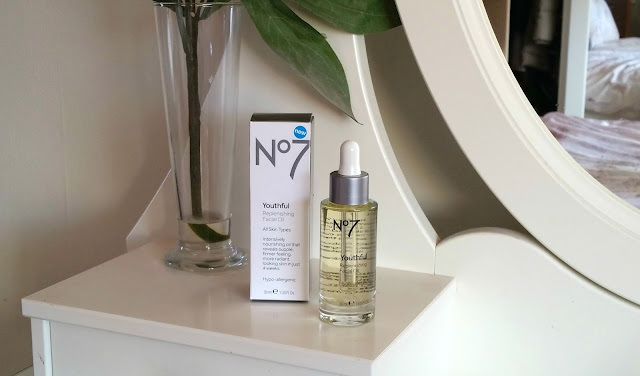 I have heard from a lot of people that using oil on oily skin is actually really good for the skin as it evens out the oils in the skin and having seen a lot of good things about this No7 Youthful Facial Oil - I stopped the assumptions and decided to just give it a go and find out for myself. I have been using this in two different ways - (1) mixed in with my moisturiser and spreading it across the face and down the neck or (2) using it instead of a serum at night then applying a small amount of moisturiser on the top. I do prefer mixing it with my moisturiser, you only need a tiny amount which makes your skin care last much longer and although at first I looked shiny and greasy and started having doubts, within a few minutes this product sinks right into the skin! I probably would only use oil on an evening so it sinks into the skin through the night and you feel lovely and pampered the next day and stick to serum and moisturiser in the morning! When you wake up after using the oil your skin feels so soft and hydrated you don't feel the need to even apply makeup - my skin has felt the best ever during the winter so far! Now I have used facial oil it is definitely a must for my skincare routine! It just shows you shouldn't be scared of oily products when having oily skin sometimes you just have to try them out and you will be pleasently surprised - I wish I did that sooner! I love this No7 Oil - soaks into the skin super quick and doesn't leave a greasy feel afterwards.